The racist skinhead logged on with exciting news: He'd just enlisted in the United States Army. "Sieg Heil, I will do us proud," he wrote. It was a June 3 post to AryanWear Forum 14, a neo-Nazi online forum to which "Sobibor's SS," who identified himself as a skinhead living in Plantersville, Ala., had belonged since early 2004. (Sobibor was a Nazi death camp in Poland during World War II). About a month after he announced his enlistment, Sobibor's SS bragged in another post to Forum 14 that he'd specifically requested and been assigned to MOS, or Military Occupational Specialty, 98D. MOS98D soldiers are in high demand right now. That's because they're specially trained in disarming Improvised Explosive Devices (IEDs), the infamous roadside bombs that are killing and maiming so many U.S. troops in Iraq and Afghanistan. Presumably, part of learning how to disarm an IED is learning how one is made. "I have my own reasons for wanting this training but in fear of the government tracing me and me loosing [sic] my clearance I can't share them here," Sobibor's SS informed his fellow neo-Nazis. One of his earlier posts indicated his reasons serve a darker purpose than defending America: "Once all the Jews are gone the world will start fixing itself." 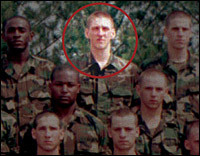 Many analysts believe that Timothy McVeigh, mastermind of the 1995 Oklahoma City bombing that killed 168 people, was radicalized during his experience as a soldier in the first Gulf War. Sobibor's SS included enough biographical details in his various posts to Forum 14 over the years, including that he's a single father from the small town in southern Alabama, that a military investigator with access to enlistment records for recent months should have little trouble determining whether the Army may actually be teaching a skinhead with genocide on his mind about tactical bomb-making. But there's little reason to expect that will happen. Two years ago, the Intelligence Report revealed that alarming numbers of neo-Nazi skinheads and other white supremacist extremists were taking advantage of lowered armed services recruiting standards and lax enforcement of anti-extremist military regulations by infiltrating the U.S. armed forces in order to receive combat training and gain access to weapons and explosives. Forty members of Congress urged then-Secretary of Defense Donald Rumsfeld to launch a full-scale investigation and implement a zero-tolerance policy toward white supremacists in the military. "Military extremists present an elevated threat to both their fellow service members and the public," U.S. Senator Richard Shelby, an Alabama Republican, wrote in a separate open letter to Rumsfeld. "We witnessed with Timothy McVeigh that today's racist extremist may become tomorrow's domestic terrorist." But neither Rumsfeld nor his successor, Robert Gates, launched any sort of systemic investigation or crackdown. Military and Defense Department officials seem to have made no sustained effort to prevent active white supremacists from joining the armed forces or to weed out those already in uniform. Furthermore, new evidence is emerging that not only supports the Intelligence Report's original findings, but also indicates the problem may have worsened since the summer of 2006, as enlistment rates have continued to plummet, and the military has struggled to meet recruitment goals in a time of unpopular war. Asked about the latest developments, military officials this fall declined to comment. A new FBI report confirms that white supremacists are infiltrating the military for several reasons. According to the unclassified FBI Intelligence Assessment, "White Supremacist Recruitment of Military Personnel Since 9/11," which was released to law enforcement agencies nationwide: "Sensitive and reliable source reporting indicates supremacist leaders are encouraging followers who lack documented histories of neo-Nazi activity and overt racist insignia such as tattoos to infiltrate the military as 'ghost skins,' in order to recruit and receive training for the benefit of the extremist movement." The FBI report details more than a dozen investigative findings and criminal cases involving Iraq and Afghanistan veterans as well as active-duty personnel engaging in extremist activity in recent years. For example, in September 2006, the leader of the Celtic Knights, a central Texas splinter faction of the Hammerskins, a national racist skinhead organization, planned to obtain firearms and explosives from an active duty Army soldier in Fort Hood, Texas. That soldier, who served in Iraq in 2006 and 2007, was a member of the National Alliance, a neo-Nazi group. "Looking ahead, current and former military personnel belonging to white supremacist extremist organizations who experience frustration at the inability of these organizations to achieve their goals may choose to found new, more operationally minded and operationally capable groups," the report concludes. "The military training veterans bring to the movement and their potential to pass this training on to others can increase the ability of lone offenders to carry out violence from the movement's fringes." In May, Army Cpl. Adrian Petty, a member of the Vinlanders Social Club (VSC) skinhead gang, posted several photos to his MySpace page showing himself in uniform serving in Iraq. One, depicting him riding in a Humvee, was captioned, "On Another VSC Recruiting Mission." Currently, 46 members of the white supremacist social networking website Newsaxon.com identify themselves as active-duty military personnel. Six of these individuals are members of "White Military Men," a New Saxon sub-group. Earlier this year, the founder of White Military Men identified himself in his New Saxon account as "Lance Corporal Burton" of the 2nd Battalion Fox Company Pit 2097, from Florida, according to a master's thesis by graduate student Matthew Kennard. Under his "About Me" section, Burton writes: "Love to shoot my M16A2 service rifle effectively at the Hachies (Iraqis)," and, "Love to watch things blow up (Hachies House)." Kennard, who was working on his thesis for Columbia University's Toni Stabile Center for Investigative Journalism, also monitored claims of active-duty military service earlier this year on the neo-Nazi online forum Blood & Honour, where "88Soldier88" posted this message on Feb. 18: "I am in the ARMY right now. I work in the Detainee Holding Area [in Iraq]. … I am in this until 2013. I am in the infantry but want to go to SF [Special Forces]. Hopefully the training will prepare me for what I hope is to come." One of the Blood & Honour members claiming to be an active-duty soldier taking part in combat operations in Iraq identified himself to Kennard as Jacob Berg. He did not disclose his rank or branch of service. "There are actually a lot more 'skinheads,' 'nazis,' white supremacists now [in the military] than there has been in a long time," Berg wrote in an E-mail exchange with Kennard. "Us racists are actually getting into the military a lot now because if we don't every one who already is [in the military] will take pity on killing sand niggers. Yes I have killed women, yes I have killed children and yes I have killed older people. But the biggest reason I'm so proud of my kills is because by killing a brown many white people will live to see a new dawn." The Army is currently investigating war crimes allegations leveled against Iraq combat veteran and active-duty Army soldier Kenneth Eastridge, 24, who in November was sentenced to 10 years in prison for the December 2007 murder of a fellow serviceman. After Eastridge was arrested for that killing, National Public Radio publicized his MySpace page, which showed Eastridge displaying a tattoo of SS lightning bolts, a common neo-Nazi insignia. Another member of Eastridge's company recently told Army investigators that Eastridge used a stolen AK-47 to fire indiscriminately at Iraqi civilians from his moving Humvee on the streets of Baghdad. "The military is to some extent desperate to get people to fight, soldiers who are not fit, mentally and physically sick, but they continue to send them," Eastridge's attorney told Kennard. "Having a tattoo was the least of [Eastridge's] concerns." As part of the research for his thesis, "The New Nazi Army: How the U.S. military is allowing the far right to join its ranks," Kennard used the Freedom of Information Act to obtain from the Army's Criminal Investigative Division investigative reports concerning white supremacist activity in 2006 and 2007. They show that Army commanders repeatedly terminated investigations of suspected extremist activity in the military despite strong evidence it was occurring. This evidence was often provided by regional Joint Terrorism Task Forces, which are made up of FBI and state and local law enforcement officials. For example, one CID report details a 2006 investigation of a suspected member of the Hammerskins, a multi-state racist skinhead gang, who was stationed at Fort Hood, a large Army base in central Texas. According to the report, there was "probable cause" to believe that the soldier "had participated in a white extremist meeting and also provided a military technical manual 31-210, Improvised Munitions Handbook, to the leader of a white extremist group in order to assist in the planning and execution of future attacks on various targets." The report shows that agents only interviewed the subject once, in November 2006, before Fort Hood higher-ups called off the investigation that December. Another report, also from 2006, covers an investigation of another Fort Hood soldier who was posting messages on Stormfront.org, a major white supremacist website. One CID investigator expresses his frustration at the muddled process for dealing with extremists. "We need to discuss the review process," he writes. "I'm not doing my job here. Needs to get fixed." A third CID report, regarding a 2007 investigation, notes the termination of an investigation of a soldier at Fort Richardson, Alaska, who was reportedly the leader and chief recruiter for the Alaska Front, a white supremacist group. According to the report, the investigation was halted because the solider was "mobilized to Camp Shelby, MS in preparation for deployment to Iraq." 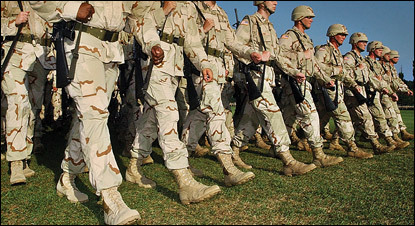 Editor's Note: As this story went to press, Southern Poverty Law Center Chief Executive Officer Richard Cohen wrote Defense Secretary Robert Gates, reiterating the request that the Department of Defense adopt a zero-tolerance policy with respect to extremists in the military. As the article notes, a similar letter, addressed to Gates' predecessor, Donald Rumsfeld, produced no action by the Pentagon.